In the zero-sum game of local property development it’s not enough to do away with the physical manifestations of our past. The very idea of longevity and durability must be cleared away. Ground and minds must be continuously tilled to improve the attractiveness of all those quick and nasty stucco bungalows and leaky condos in waiting. Sure, history does represent some value add. Like the names of former local landmarks transferred onto the otherwise indistinct towers of concrete and glass, the inhabited tombstones inscribed with the names of the dead: Salt, Opsal, O’Keefe. Sometimes the past serves a more practical function. Take the midden at Xwayxway, in what’s now Stanley Park. Thousands of years of habitation produced a calcium-rich shell cache 2.5 metres deep, enough raw material to pave a cement road from Coal Harbour to just shy of Prospect Point. These are exceptions. Typically, history imposes costs -like the mandatory preservation of an art deco façade, say. Or, worse yet, it eliminates opportunities altogether. The ultimate scourge of those with $s for eyeballs? Class ‘A’ Heritage. The Musqueam First Nation doesn’t own the property on the 1300 block of Southwest Marine Dr., they only occupied it for some 4,000 years. The remains of their ancestors occupy it still. The National Historic Site designation offers no protection. The civic mandarins, unable to withhold a building permit for archaeological discoveries (sic), shrug their shoulders from the sidelines. 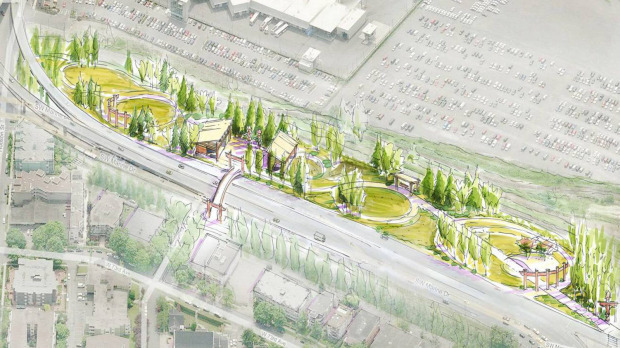 The carnage was underway when the Band presented a rare vision: a win-win; a property swap and the transformation of the threatened site into a public park. But the Development Coordinating Committee, better known as the provincial cabinet, hesitates. Threatened -perhaps- by a past not quite completely buried, by the diminished splendour of a future fettered by unsightly historical complications. Possibly fearful of rights unceded, of a resurgence of the River Grass, of the subtle communication to all those heading north on the Arthur Laing: Welcome to Musqueam Territory.